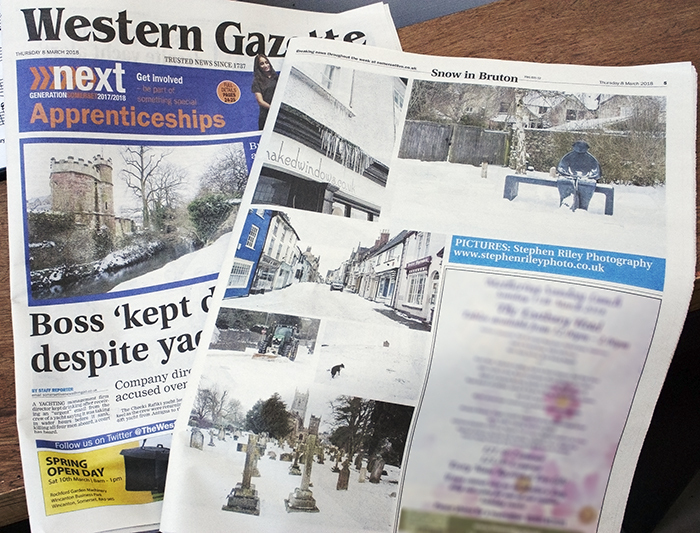 I am very pleased to report that a bunch of my photos made it into the Western Gazette this week – the Thursday 8 March 2018 issue. The photographs featured are from the series I shot of Bruton in the snow after last week’s blizzard. There is one on the front page and there is a full-page spread on page 5. Do check them out. If you would like to see more of these snow shots and Bruton in other guises, I have a page devoted specifically to the town: click thru’ here. Stephen Riley Photographer Somerset, Wiltshire and Dorset.